"Les Papes, cinq siécles de signtures - premier catalogue raisonné"
The Premiere edition is limited to 1100 examples. The first 100 had been signed by the author and number 851-1199 are reserved to the museum of Penthes. We can hightly recommend this reference book written in french to all pope autograph collectors and you could find autograph illustrations never published before from Pope Sixtus IV until Pope Benedictus XVI nearly always with the "cardinal signature" as well the pope autograph next to each other with interesing informations about the signature characteristic and rarity. This work is the final accomplishment of forty years of research and study. This initiative was warmly encouraged by Pope John Paul II. It offers for the first time to the amateur as well as to the attentive researcher a precise “catalogue” of the signatures used by the fifty Sovereign Pontiffs which served from 1503 until today. 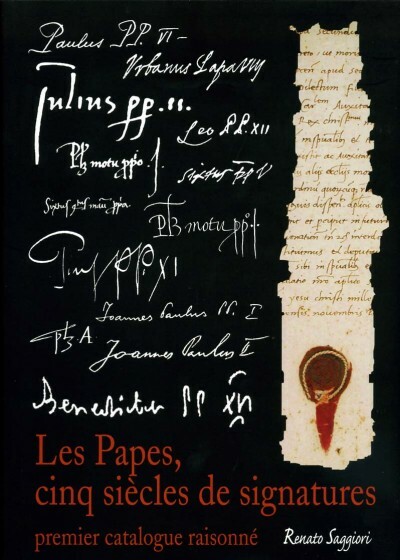 The introduction proposes some interesting original documents connected to the history of Popes and their election procedures : items relative to Conclaves, a reproduction of a precious manu_script_ signed in 1114 by Pope Pascal II and by his successor Gélase II, information pertaining to the rarity of papal autographs and to certain types of counterfeits, etc. Synthetic but precise biographies, as well as portraits printed from old engravings or photos of a time precede the signatures reproduced at a natural scale (generally two: one before, one after the election). A document for each Pontiff is reproduced in a full page. Certain ones have an historic content : a Proclaim, signed by Pius VI in 1809, excommunicating Napoleon 1st, an autograph letter signed by Clement VIII to Maria de Medici, complimenting her for her marriage to Henry IV of France, another letter signed of his own initiative (motu proprio) by Pius VI authorizing his negotiators to sign the Treaty of Tolentino, imposed by the young General Bonaparte in 1797, etc. Remarkably precise and clear, this work ends with a reasoned index, containing all names and places cited in the documents. The author, Renato Saggiori, is a worldwide recognized paleographic expert.